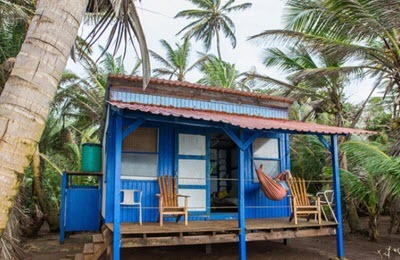 Here are a few examples of hotels and hostels located on Little Corn Island. Many people prefer this side of the island since they enjoy the eastern breeze. If you prefer a less windy location, the other sides of the island are better choices. Three beachfront huts on stilts. Very simple and budget friendly option. Serves food made from whatever is available today. When you arrive to the port, head south and follow the signs to Casa Iguana. 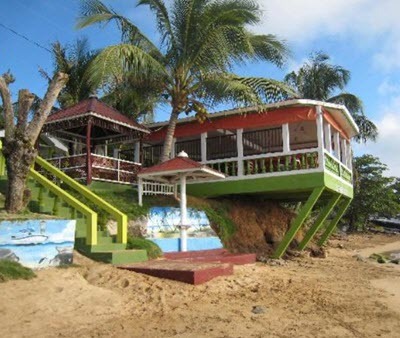 This place opened in 1994 and is thus one of the pioneers within the tourist sector in Little Corn Island. The buildings sits on an 40 acre private reserve above two coves. Casa Iguana offers 15 rustic Caribbean-style casitas with wide verandas. They are built to allow the prevailing wind from the east move through them and keep them fresh. Accepts cash, VISA and MasterCard. If you have booked in advance (which is recommended), staff from Casa Iguana will meet you at the port and help you with your luggage. Huts set back a bit from the beach. Restaurant located closer to the beach. Restaurant chiefly serves fried fish. Clean rooms with a view of the beach. All beds have mosquito nets. Beach restaurant with Caribbean and international dishes. Don’t miss the french toast made from coconut bread. Accepts cash and credit cards. Arranges beach volleyball matches and bonfires. Located on Cocal Beach, circa half a kilometer north of Casa Iguana. Bungalows with big verandas located very near the water. Has an eco-friendly profile and collects rainwater, recycle waste, and pays to ship non-recyclable waste to Managua instead of depositing it anywhere on the Corn Islands. Sponsors beach cleanups and the annual free veterinary clinic. You can rent snorkeling equipment, paddle board and kayak. Firefly Studio is a 500 sq ft screened in Yoga & Massage studio surrounded by lush tropical vegetation. Here is a selection of hotels and hostels suitable for those who wish to live near the port. Located 50 meters from the pier, 1 minute walk from the port. Clean and comfortable air conditioned rooms. Breakfast included in the room price. Expect 20-30 minutes of walking through the forest to get here from the port. Take the trail from the north of Dive Little Corn and continue straight until your reach Derek’s Place. If you book in advance, ask Derek to pick you up in his boat at the port so you don’t have to walk. Four huts on a grassy lawn overlooking the ocean. Three of them have double beds. One of the them have 2 double beds and glass bottle walls. From the port, head north and follow the signs. Walking from the port to Ensueños will take about half an hour. Rent a Guest Suite or a Cottage on this secluded farm. Both options come with fully equipped kitchens. 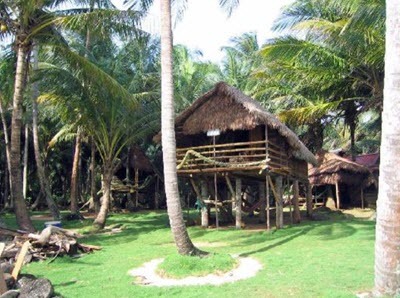 The farm is located by a sandy bay and surrounded by lush forest. 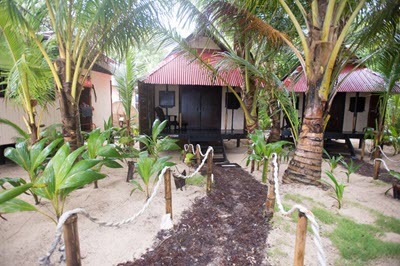 The farm produces coconuts, vegetables and tropical fruits. If you book in advance (strongly recommended) they will pick you up with their boat as you arrive to the municipal port with the panga from Big Corn. Eco-chic luxury ocean-front villas in the upper price segment. Coconut water, fresh fruit and detox juices, smoothies and cocktails are available throughout the day.